Media Day for Virtual Sports to showcase their new 28,000 sq. ft. entertainment facility featuring the Northwest's newest indoor laser-tag experience, one that guests of all ages will enjoy! Virtual Sports has taken a 28,000 square foot warehouse and outfitted the interior with 3 maze-like arenas, a leisure areas for guests and patrons, a beer/wine bar, and rotating concessions featuring some of the region’s most favored food trucks. Media showcase for Virtual Sports’ new recreational entertainment facility set to take place Thursday, September, 25th. Come experience everything Virtual Sports has to offer! 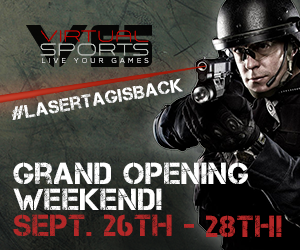 Virtual Sports will host media for photo/video opportunities, a few rounds of gameplay, and an in-depth tour of the 28,000 sq. ft. facility, including detailed explanations of the scoring system and online components of ICOMBAT, and an up close and personal look at the equipment. Virtual Sports, one of iCOMBAT’s first licensees in the NW, are finally ready to open their doors to the public! Virtual Sports promises an experience unlike any other; an immersive simulated-battle experience with realistic weapons, collaborative and team based gameplay, all within a dazzling indoor environment. Located near Tukwila’s southcenter, Virtual Sports has taken a 28,000 square foot warehouse and outfitted the interior with 3 maze-like arenas, a leisure areas for guests and patrons, a beer/wine bar, and rotating concessions featuring some of the region’s most favored food trucks. ICOMBAT, the original purveyors of this immersive simulated-battletech, have a number of successful licensees across the nation. They also provide equipment and infrastructure to several Law Enforcement Agencies for training purposes. In collaboration with ICOMBAT, Virtual Sports has finally brought this futuristic form of indoor laser-tag to the Northwest for guests of all ages to enjoy. Thursday, September 25th, between 11am and 5pm. If you would like to schedule a time outside of this window on Thursday please contact Erin Danforth below. For More information, or if you wish to RSVP to this media event, please contact Erin Danforth, erin@bonsaimediagroup.com, 206.427.1613 by 6pm on 9/24/14.